This Nov. 25, we want to share Small Business Saturday with you! It’s a holiday shopping tradition that celebrates small businesses like the ones in our BID. 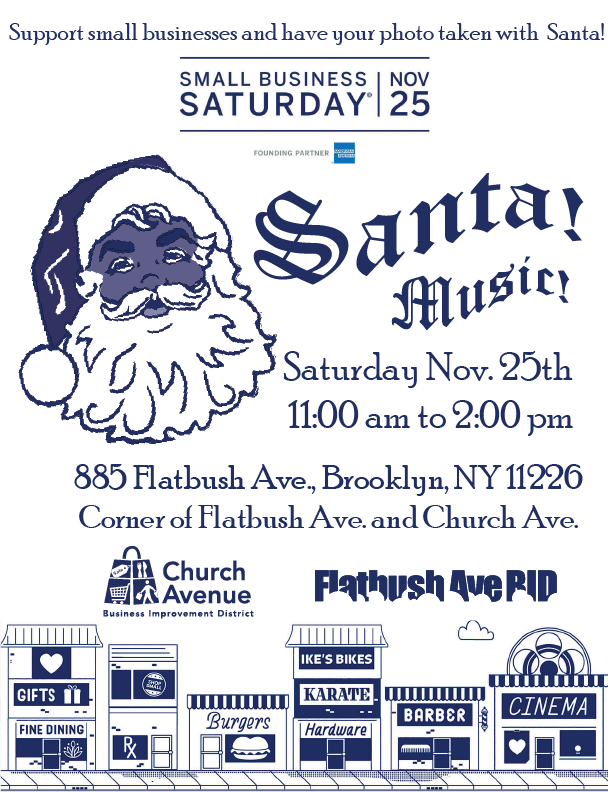 Also, on that day, we are bringing Santa and distributing “Shop Small” giveaways to shoppers from 11:00 a.m. to 2:00 p.m. outside the Citibank at 885 Flatbush Ave. (corner of Church Ave.). We’ve ordered additional freebies and store decorations for the BID’s businesses…contact us asap if you would like items dropped off at your business (while supplies last)! So mark your calendar for Nov. 25 — the Saturday after Thanksgiving — and get ready to Shop Small in the Flatbush Ave. BID. Thank you for all your support, and see you Saturday, Nov. 25!